Explanation: Stars can form in colourful surroundings. Featured here is a star forming region rich in glowing gas and dark dust toward the constellation of the Swan (Cygnus), near the bright star Sadr. This region, which spans about 50 light years, is part of the Gamma Cygni nebula which lies about 1,800 light years distant. Toward the right of the image is Barnard 344, a dark and twisted dust cloud rich in cool molecular gas. 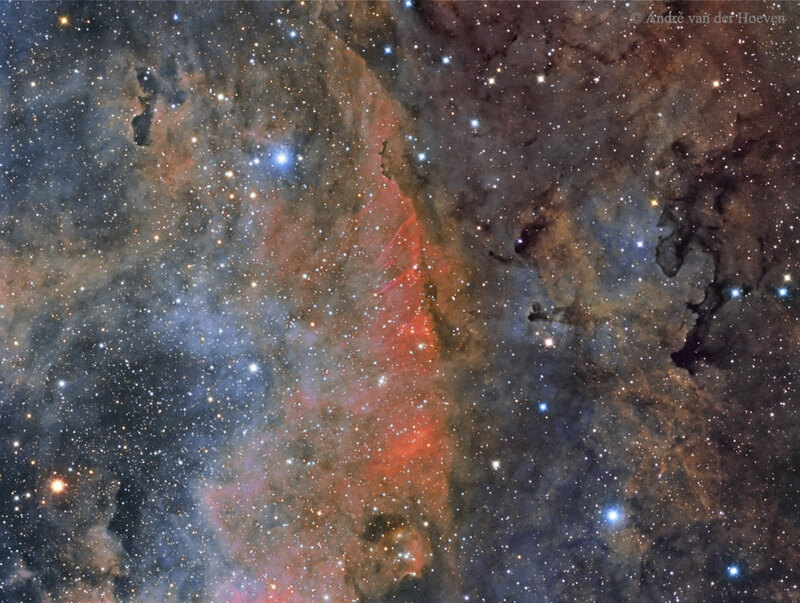 A dramatic wall of dust and red-glowing hydrogen gas forms a line down the picture centre. While the glowing red gas is indicative of small emission nebulae, the blue tinted areas are reflection nebulae -- starlight reflecting from usually dark dust grains. The Gamma Cygni nebula will likely not last the next billion years, as most of the bright young stars will explode, most of the dust will be destroyed, and most of the gas will drift away.